Kent Lundmark topped a 758-player field at the PokerStars European Poker Tour Barcelona to become the sixth Swedish EPT champion. The 22-year-old’s final obstacle was Spain’s Jesus Marquez Lizano as the two went head-to-head for the last stand with 12 million in chips each. An hour and 20 minutes later, Lundmark walked away from the biggest poker tournament ever held in Spain with the title, the trophy, and the €825,000 top prize. Lizano received €525,000 for second place, but his result created a new record for Spanish players on the EPT, with the previous record belonging to Santiago Terrazas who finished third at the same event in season six. Things kicked off quickly with two players busting early, one after the other. Italy’s Francesco Notaro bet 200,000 and was three-bet to 570,000 by Lizano. Notaro moved all in for 1,370,000 and after a moment Lizano made the call. Lizano’s A-Q was behind Notaro’s A-K but a queen was dealt on the river to make Notaro the first casualty of the final day. In the very next hand Thor Stang’s pocket jacks beat Georgios Skotadis’ pocket tens and sent him hurtling out of the event in seventh place. Stang was next to go however as his K-Q could not better Lundmark’s pocket fives. Guiseppe Pantaleo who had held the chip lead going into the last two days experienced a painful final table which saw the trophy move further and further out of his reach as play progressed. Pantaleo appeared to be highly frustrated early on in the day after a big pot against Lizano. The two players checked a flop of Q 6 2 and the turn was dealt the Q . Lizano bet 230,000 from the big blind and Pantaleo called from the button. The river was the 2 and Lizano bet 330,000. After a few moments of thought Pantaleo raised it up to 790,000, sending Lizano into the tank. Eventually, the Spaniard called and Pantaleo instantly, and perhaps prematurely, mucked his cards. Lizano flipped over jack-high to take down the pot, but when Pantaleo saw his cards, horror filled every inch of his face. After a few more ups and downs, Pantaleo was finally put out of his misery when Kent Lundmark called his 3,095,000 all-in with pocket queens which stayed ahead of Pantaleo’s A-J. Lundmark then set his sights on Shander de Vries. 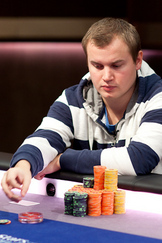 De Vries moved all in for his last 122,000 in chips with Q 8 and was called by Lundmark who held A Q . The flop brought an interesting 10 7 6 but de Vries hopes ended on the blank turn and river and he made his exit in fourth place. Lizano quickly put a stop to Lundberg, making him the short stack threehanded. Lundberg four-bet all in with A-2 and was called by Lizano and his pocket queens, which won the massive pot, doubling up the local hero. Lizano then took a chunk of chips from Russian Konstantin Puchkov, but Lundmark finished Puchkov off, putting himself back in the game. Puchkov kept his final hand, pocket kings, quiet, electing to call Lundmark’s preflop bet of 245,000. The flop fell J 7 3 and Lundmark bet 245,000 again from the button. This time Puchkov check-raised to 700,000 from the small blind, triggering Lundmark to move all in. Puchkov called and saw his K K were up against the middle pair and flush draw of Lundmark who held 7 6 . The turn was the 10 but the river was the K which although gave Puchkov a set, meant Lundmark made his flush. Lundmark and Lizano tussled back and forth heads up for over an hour when the last hand of the event came. It was A-Q for Lundmark versus Lizano’s K-J and an ace on the river sealed the deal, making the Swede the EPT’s newest champion.